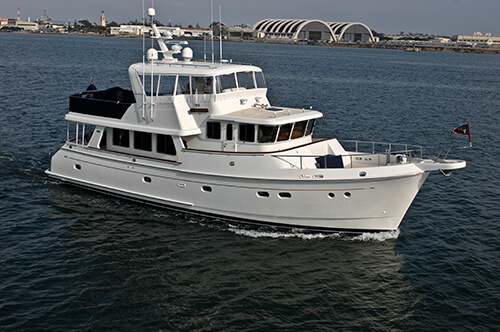 Luke Brown Yachts has sold more Offshore Motor Yachts, Expedition Yachts, and Trawlers since 1969, than any other firm in the industry. Technically there is no clear delineation between a Motor Yacht, Trawler and Expedition Yacht. The term Trawler and Expedition Yachts are interchangeable. Typically, a Motor Yacht is considered a vessel that provides comfortable overnight accommodations, for multiple people, and can achieve speeds that exceed those of a Trawler or Expedition Yacht. The hull form used in a Motor Yacht allows for higher speeds, with the ability to operate as efficiently as a Trawler or Expedition Yacht. 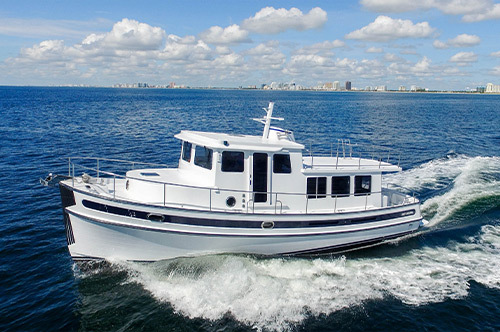 INTERESTED IN PURCHASING A TRAWLER? SEND US A MESSAGE AND WE WILL HELP YOU WITH THE PROCESS. Trawlers and Expedition Yachts typically operate at their hull speed which is the speed at which the vessel cuts through the water before attempting to overtake its bow wave. At that point the vessel will begin to rise by the bow, squat down at the stern, and operate very inefficiently. The hull speed is determined by multiplying 1.34 times the square root of the waterline length. For example, this would give a vessel with a 50' waterline a theoretical hull speed just under 9 1/2 knots. Trawler or Expedition Yachts can be as much as 4 times more efficient than a Motor Yacht that is running at higher speeds. In addition to efficiency and being able to travel greater distances, the Trawler and Expedition hull form provides a safer and more comfortable motion in adverse sea conditions. Some of the more popular displacement Trawler and Expedition Yachts are brands such as; Nordhavn, Kadey Krogen and Selene. 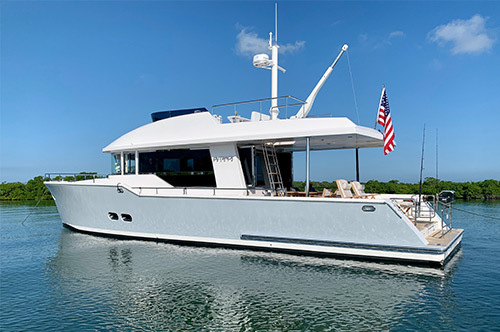 Many designers and builders have addressed a segment of the market that appreciates the positive attributes of both the Trawler Expedition Yacht and the Motor Yacht. Often these yachts are referred to as semi-displacement vessels. These vessels operate efficiently at slower speeds but are typically able to achieve speeds of up to 50% faster than a true displacement vessel. Builders of semi-displacement yachts may refer to them as Motor Yachts, Trawlers or Expedition Yachts. While this does create some confusion in the market place, a marine professional, such as those of us at Luke Brown Yachts, can help add clarity to the confusion created by various interpretations of these terms. In this category of semi-displacement vessels, some of the more popular brands are: Fleming, Marlow, Grand Banks, Outer Reef, and Nordic Tugs. There is also a class of Motor Yachts that have a hull form and an engine package that provide a hull speed greater than a typical semi-displacement yacht but that are built to rugged scantlings. Typically, these are intended to reach speeds of 20 knots or greater, but have features making them more suitable for offshore service than other Motor Yachts like Portuguese bridges, larger freeing ports, and strong window installations. All contribute to the look and benefit of safety and comfort in inclement conditions. 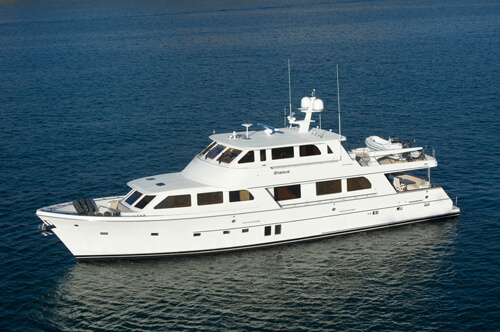 We at Luke Brown Yachts, refer to this class of vessel as an Offshore Motor Yacht. Some popular models of this genre are: Marlow Yachts, Offshore Motor Yachts, Ocean Alexander Yachts, and Cheoy Lee.